Originating in Nepal, the kukri blade geometry is time proven to be one of the most effective for chopping, making it an excellent choice for camping, hiking, and survival uses. Modern kukri productions come in all sizes, colors of finish and material options, but the success of the blade still relies on the original geometry. The heavy set front powers though your target, while the sloping blade helps to draw your target across the edge. This Gator machete with kukri blade features Gerber's renowned Gator grip, which offers a secure hold even while wet, and absorbs much of the shock from chopping. The blade is full tang, crafted using tempered 1050 carbon steel, and given a corrosion resistant black finish. A nylon sheath with belt loop and D-ring is included for secure transport and storage. This pieces features a 12 in. blade and measures 19 in. overall. This was one of the few styles of blades I did not own. 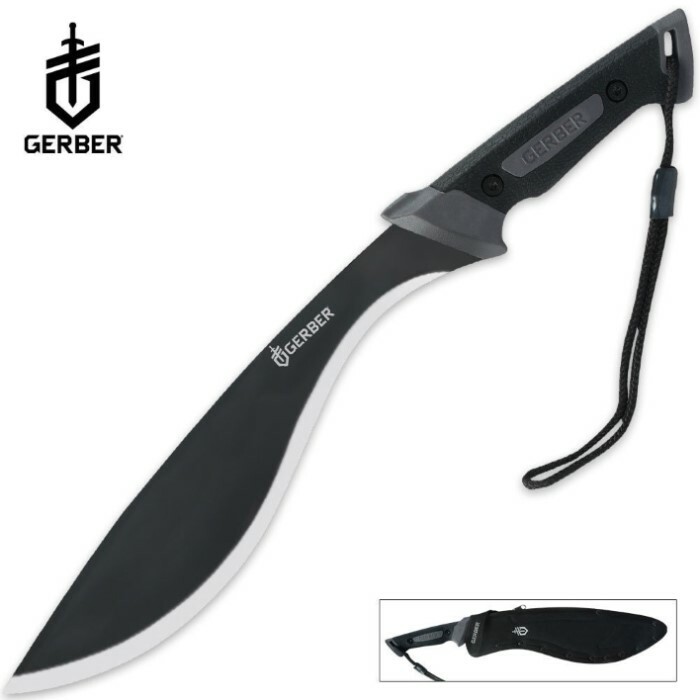 Gerber has a solid reputation and they do not disappoint with this Kukri. I am very satisfied with the purchase. The blade came plenty sharp and the scabbard is of high quality as others have commented on. It has a good heft and feels natural when swung. Whether its brush, small trees or the odd neighborhood zombie, this blade will get the job done. OMG this is BY FAR the best machete i have ever bought!! it is weighted properly and very sharp. i use this to chop down trees! the grip is rubber witch is really nice AND THE CASE IS THE BEST QUALITY I HAVE EVER SEEN! this will deffinetly be added to my zombie weapon collection! I recently got the chance to test out my Gerber Gator Kukri Machete and it is absolutely perfect! Clears brush easily, chops through tree branches, you can even dig with it! The only issue I had is it doesn't keep an edge extremely well, but PLEASE do NOT let that stop you from buying this! also, it comes razor sharp RIGHT OUT OF THE BOX! would make a great gift for anyone who needs a brush clearer or tomahawk replacement or anyone who just wants a freaking awesome tool/weapon! Outstanding ! This Kukuri is just the right sizes. The 1050 seems to be a good and well heat treated metal. I comes sharp enough to use right out of the box, but being a purest , I had to make it scary. I can serve as a gardening tool. a kitchen tool and a weapon if necessary. Keep it well oiled and sharp and you'll never need another Each has their own Serial number. May I mention that it's so nice to see a company tell you what metal the blade is made of. I see so many ads that say," Stainless steel". I immediately think of 440A which is basically good only for salt water scuba divers and very had to keep sharp. Tell me what I'm buying !. This product is great. I bought One and was so impressed with the quality of the knife and the sheath that I bought Two more. I would definitely recommend buying. I received my Gerber Gator Kukri in the mail today. Spent a little time sharpening it, took it outside and chopped a few branches. I have used a couple of standard Columbian machetes clearing vines, brush and branches for years...however the Kukri blade design with the blade weight concentrated towards the end of the machete, makes the job of trimming and chopping less strenuous. Gerber quality is always outstanding, and this Kukri is no exception. The Gator handle is a secure grip, the blade is carbon steel and is easily sharpened and a little flexible to prevent breakage, the sheath is very well made. The price of this item is also reasonable...I am very pleased with this item. Quick shipping too...ordered Monday evening, received in the mail Thursday. Thanks Kennesaw.